1. The hydraulic braking system is an efficient type of braking system as compared to any other braking systems likes mechanical linkage braking system because mechanical braking system has various disadvantages such as high wear and tear rate in the larger number of components due to friction and stresses, large response time due to the various linkage and mechanisms. 2. The hydraulic braking system works on Pascal’s law and hydraulic energy so with the application of small force we can generate lager work output which results less effort is required as input. 3. Due to the application of hydraulic energy, the response time for hydraulic braking system is very small and efficiency is very large. 4. 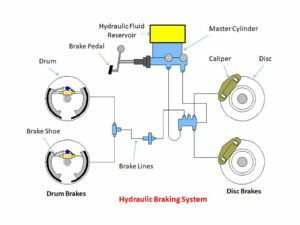 Construction of the hydraulic braking system is very simple as compared to other types of braking system, there is no complex mechanism required for the force transmission. Only hydraulic fluid is responsible for the whole operation. Hydraulic fluid travels in the whole system through the hydraulic lines so we can say that hydraulic lines replace the different mechanisms of the mechanical braking system. It is the main part is the whole assembly. It works as a hydraulic actuator which has a piston-cylinder arrangement. It is responsible for the conversion of mechanical force into the hydraulic force. 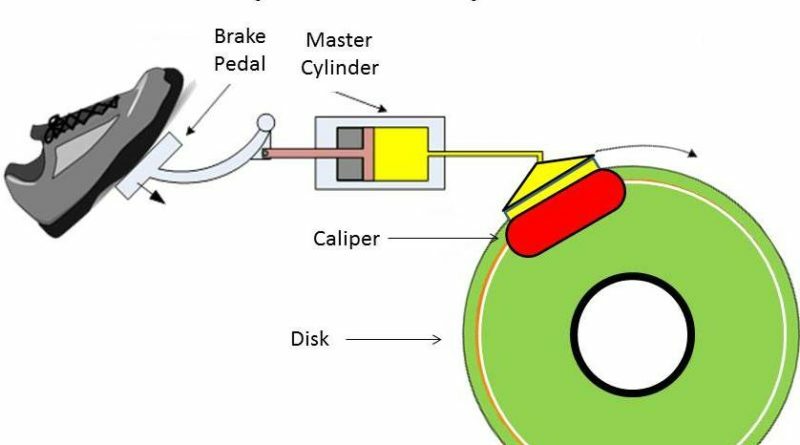 As the brake pedal is pressed the fluid in the master cylinder compressed and exerts pressure which is transmitted to Brake assembly through the hydraulic lines. Brake pedal works as the input to the master cylinder or we can say that whole assembly will start working when the brake pedal is pressed. It is pressed manually when we have to stop or slow down the running body. It is further attached with little mechanical linkage such as spring which helps in retraction of the pedal further it connects to master cylinder. After the execution of the brake pedal, the master cylinder comes into the working. It is kind of a small tank for the braking fluid. It is directly attached to the master cylinder. For the proper operation of hydraulic braking. It is necessary to maintain the accurate amount of braking fluid in the whole assembly. Sometimes due to small leakages the level of fluid goes down into the master cylinder so to maintain the proper amount of brake fluid in the working operation a reservoir is required. The braking fluid goes into the master cylinder from the reservoir when it is required. Hydraulic lines are the connections between the various components of the braking system. Braking fluid travels through these lines from master cylinder to brake. These are the small diameter pipes which replace the different types of mechanical linkage in case of mechanical brakes. Brake calipers are the parts of the braking system in case of disc brakes which execute the brake. Inside the brake calipers pistons are mounted which is responsible for the braking. The brake pads are also attached with the piston. Calipers are mounted on the periphery of the disc. The disc brake is externally applied braking system. A disc is mounted in between the calipers. Drum cylinder is a kind of small cylinder which is used in the Drum brakes and situated inside the brake drum and connected to both the brake shoes. A drum brake is internally applied brakes. 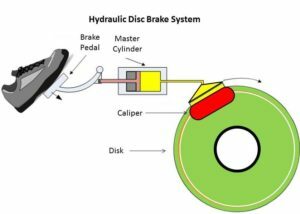 Working of the hydraulic braking system having disc brake starts with the pressing of brake pedal. Due to compressive action the fluid the brake fluid compressed into the master cylinder by means of piston-cylinder arrangement. 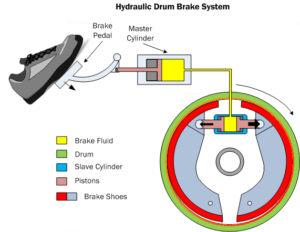 The compressed fluid creates pressure in the hydraulic supply lines and then transfers whole pressure energy at the brake caliper of the disc brake. A disc is mounted in between the calipers. Both the calipers have piston arrangement and brake pads are mounted on the piston. As the brake pedal is pressed then the movement in the pistons starts i.e. both the pistons start moving towards the discs and at the end brake caliper compresses the disc and brake executed then running parts stop. If we release the brake pedal then the pressure in the hydraulic line reduces and the pistons in the calipers move outwards and brake released. The initial working of the drum brake is the same as disc brake the difference is in the execution of the brake. In case of drum brake; drum and drum cylinder is used at the place of disc and caliper. As the brake pedal is pressed the high-pressure fluid goes in the drum cylinder of drum brake by means of hydraulic lines. As the fluid reaches into the drum cylinder it starts expands and presses the brake shoes and brake is applied. When we release the brake pedal then spring between both the brake shoes is responsible for the releasing of the brake. After the releasing the brake pedal fluid from the brake cylinder return back and brake released. This is all about working or hydraulic brake. If you have any query regardin this article, ask by commenting. If you like this article, don’t forget to share it on social networks. Subscribe our website for more informative articles. Thanks for reading it. How a Single Plate Clutch Works? ← How Air Brakes Works?